Providing you the best range of exhibition display stands with effective & timely delivery. We can manufacture Exhibition Display Stands, portable display stands, customized display stands, x banner stand bridge, l banner standee, poster standee, triple sided banner, premium roll up. 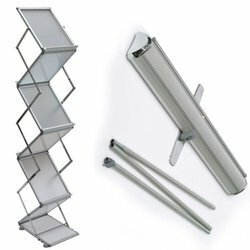 Looking for Brochure Stand Repairing Services ?